Jason Pierre-Paul: "I Know I’ll Get to Tom Brady"
I mean, there’s really nothing left to say: Jason Pierre-Paul is back and with that, the Giants defensive personality has returned as well. 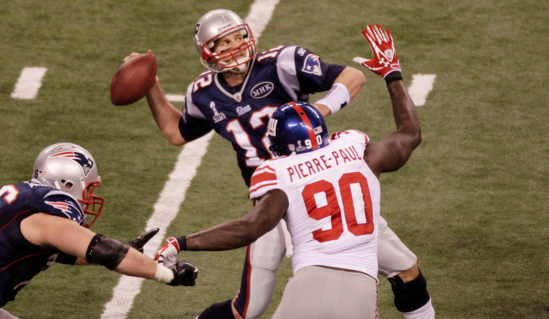 The Giants host the New England Patriots on Sunday, and Pierre-Paul is confident that the he and his pass-rushing compadres will make things difficult for Tom Brady. “We’re going to get to the quarterback, I know I am,” Pierre-Paul told reporters on Wednesday. The undefeated Patriots will be heavily favored, which is always a glorious and comfortable spot for the Giants when it comes to Bill Belichick and company. “Like I say, they’re undefeated, but they have to come through here first," JPP said. “Yeah, it’s a different group. It was me, (Justin) Tuck, Osi (Umenyiora), those are pass rushers." The Giants (5-4) are currently sitting on top of the NFC East, and beating the 8-0 Patriots could solidify their status as playoff hopefuls.